Begin their new campaign after KCDC Protest with a workshop uniting all seven sectors of HSR Layout. things that could help them in this direction. HaSiRu Mithra‟s first such workshop will happen on December 13th. It is the right event at the right time. Bengaluru is reeling under a severe garbage crisis. The Bruhat Bengaluru Mahanagara Palike (BBMP) spends Rs 300 to Rs 500 crore on waste management and yet there are tonnes of waste across the city. Not to mention, toxic landfills in and around the city. 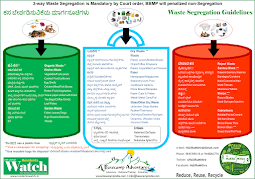 “Segregation not only reduces cost, pollution (air, soil, water) and fewer landfills, but also increases recycling, composting, resources recovery and sustainability,” says Lalithamba V, another HaSiRu Mithra member. “The twin methods of segregation and composting promotes greener, cleaner and healthier environment,” says Brig (retd) RS Murthy, President, HSR Layout Sector 2 Residents Welfare Association, and an active member of HaSiRu Mithra. HaSiRu Mithra is inviting residents to be part of this workshop and also bring their family and friends. They are also encouraging people to bring their children as well as the workshop will have Poster Making competitions and Waste Segregation games for children. And those who want to join HaSiRu Mithra and spread the message of segregation and composting can register on December 13th and become a volunteer with HaSiRu Mithra.